Here is Funny Light Mood Stuff – If You Follow It, You Can Make Facebook Text Upside Down. It is Selective Mirroring of Texts on the Web GUI. Someone was sharing some Google tricks on Facebook, actually Google tricks are official. Just one important thing – make your Facebook safer to some extent. If you have no idea – Facebook is one of the dangerous websites and web services which scraps users’ personal details as a part of NSA Spyware Activities. 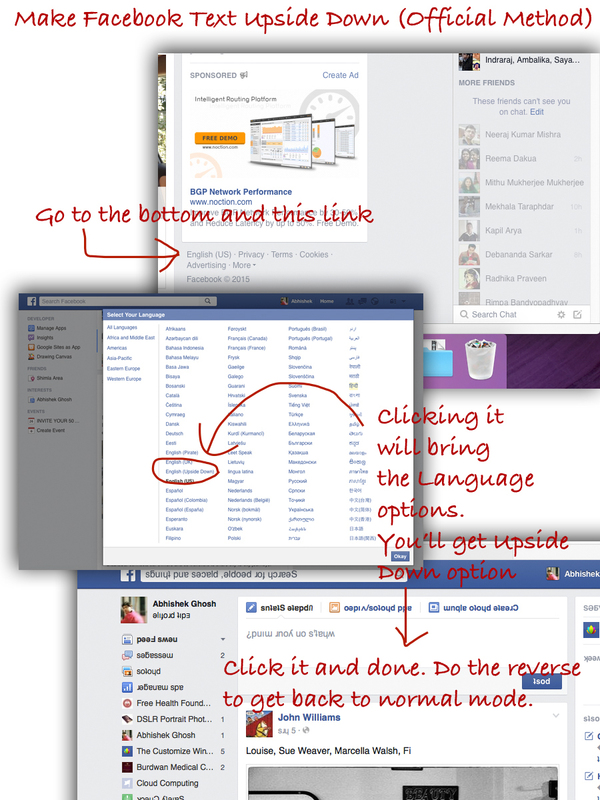 This small guide to make Facebook text upside down is for fun only. We are security related to some extent, we can not advice to use Facebook. This Article Has Been Shared 1690 Times! Service Oriented Architecture or SOA is an architectural pattern of IT which plays a special role on business processes, where levels of abstraction are basis. Cite this article as: Abhishek Ghosh, "Make Facebook Text Upside Down (Official Method)," in The Customize Windows, April 29, 2015, April 23, 2019, https://thecustomizewindows.com/2015/04/make-facebook-text-upside-down-official-method/.